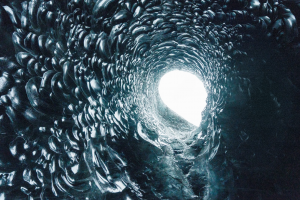 Home » Ice Caves in Iceland, what you need to know. What exactly are Ice Caves? Although summer in Iceland promises endless days and warmer weather, the winters are just as, if not more exciting. 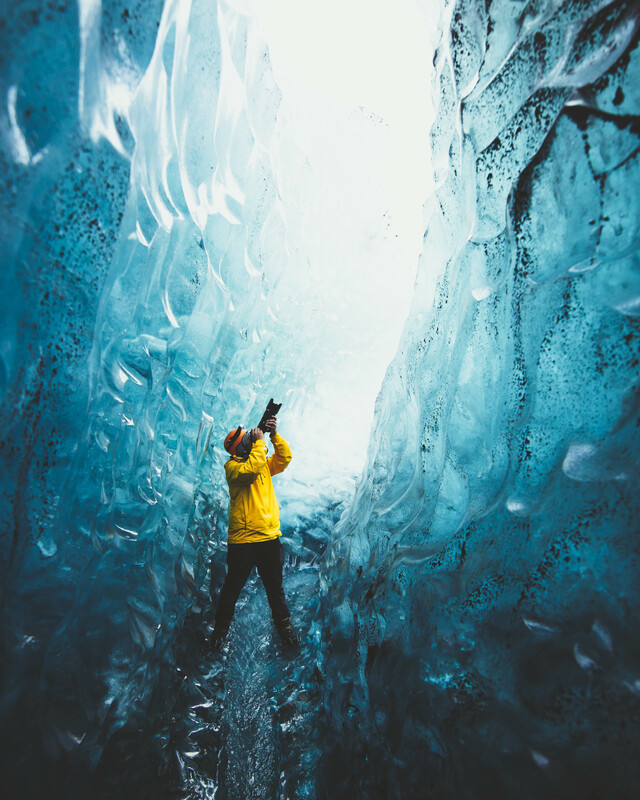 From around November to March each year, Ice Caves season is in full swing – and exploration of these glorious artworks of nature can be experienced and photographed in full safety. 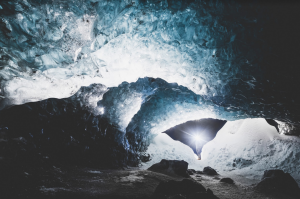 Located within Iceland’s glaciers, the ice caves are totally magical formations that burst with vibrant hues and patterns of blue, turquoise, white, gray and black. Filled with a world of different textures, light passes through the walls to create fascinating compositions. 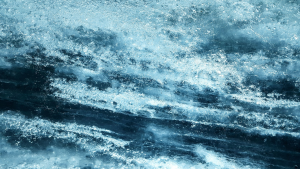 These impressive passages of raw and untouched ice contain a spellbinding beauty like no other. Walking through one is a breathtaking adventure that will have you in awe from start to finish, and is an experience that you will definitely remember for a very long time. You will be literally in the heart of a glacier that has formed thousands of years ago. How often does that happen?! Ice Caves change every year! What makes the ice caves even more precious, is that they are ever-changing – they shift in shape daily. Here one week, they could be gone the next. Each season reveals several never before seen passages, with new caves being discovered frequently. So what you experience will be completely unique, and entirely up to Mother Nature. How are ice caves formed? The shapes and locations of these ice caves change so often because of the glaciers that they are in. The glacier advances in the winter and melts in the summer. The melt-water from the warmer months and sunlight carve channels into the glacier ice, forming rivers that eventually create tunnels through the bottom of the glacier. In the winter, the cooler weather stops the glacier from melting and actually causes the ice to harden and contract even more. This means no more melt-water. The “tunnels” that the melt-water once flowed through become the mesmerizing caverns of crystalline ice that are so loved by all who visit them. The caves themselves can be as wide as ten meters, and also narrow enough in some sections so that only one person may pass through at a time. What about the crystal blue ice cave? Before witnessing the surreal atmosphere of these caves, it is important to know which of these short-lived wonders is accessible, and which aren’t. Many tour companies are still advertising the crystal ice cave as one that can be accessed during this year’s ice cave season. The reality is that, since mid-season of 2017 it has been flooded and is unable to be visited. It is still, however, possible to witness the magical blue glacial colors inside other caves and formations in Iceland. Visiting ice caves in Iceland and safety! Glaciers are beautiful and attract many tourists each year, however, it’s beauty can only be matched by it’s danger. We highly advise that if planing to visit an ice cave in Iceland you do it with the right equipment and with experienced guides. It is true, that in Iceland there is now law to forbid you from exploring the glacier on your own, however, this is where common sense should kick in. 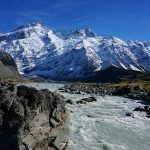 If planing to visit the glacier ensure that you have the right equipment and experience, or book a tour with a repeatable glacier tour company. We will be in Iceland 2018 December 22- Jan 3 , how is it possible to travel to and photograph caves with 4hrs of daylight ? ?on a 1 day tour. During the dark winter nights in December we are still running tours. Usually we start the tour a bit before sunrise and by the time we arrive to the cave the sun is already up. The Winter months are beautiful for photography as the sun hangs low and offers magical light. I am going toIceland in August. Are the ice caves still there and can you explore them during this time of the year. Unfortunately the Ice Caves are not accessible in August due to the melting of the glacier, meaning that the Ice Caves are full of water.